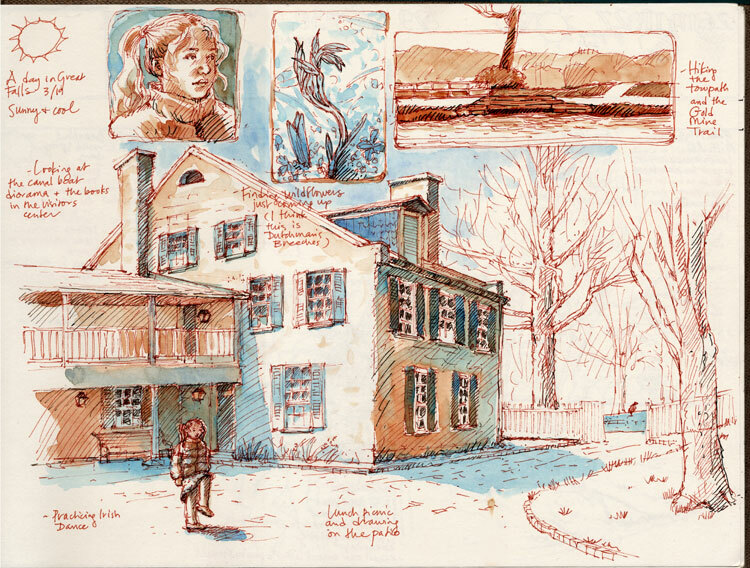 From my sketchbook, in the spring a couple of years ago. We took a break from lessons in the middle of the week to walk along the C&O Canal, look at emerging wildflowers, visit the small history exhibit in the Great Falls Tavern Visitors Center, and have a picnic lunch in its garden. One of the many advantages of homeschooling. I’m sorry; it’s not what you hoped—that is, if you were hoping for tips on getting your life and your environment organized. (Actually I came across a really useful blog for that the other day, though; Totally Together Journal.) No, this is the City of Washington, DC doing its river-tidying, which my daughter and I discovered by accident. Did you ever wonder what happens to the logs and branches that tumble into the Potomac River upstream whenever there is a hearty spring rainstorm? Well, a tugboat glides up and down the river gathering them in its little metal arms and transfers them to a barge for removal. So they don’t bash into you when you are out in your Thompson’s or Fletcher’s rental canoe. Your DC taxes at work. Passover begins at sunset today. 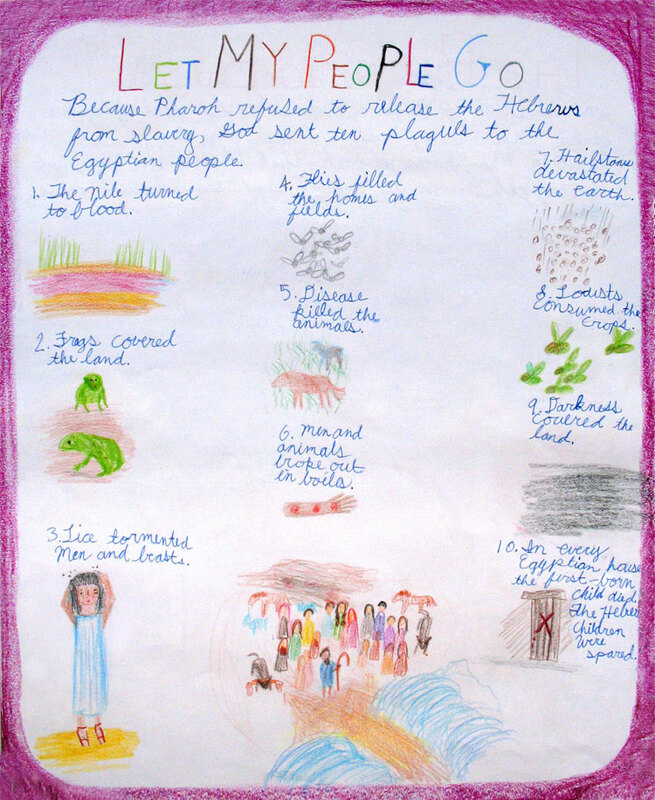 In celebration I post here a page of my daughter’s Main Lesson book from our Stories of the Hebrew People block. 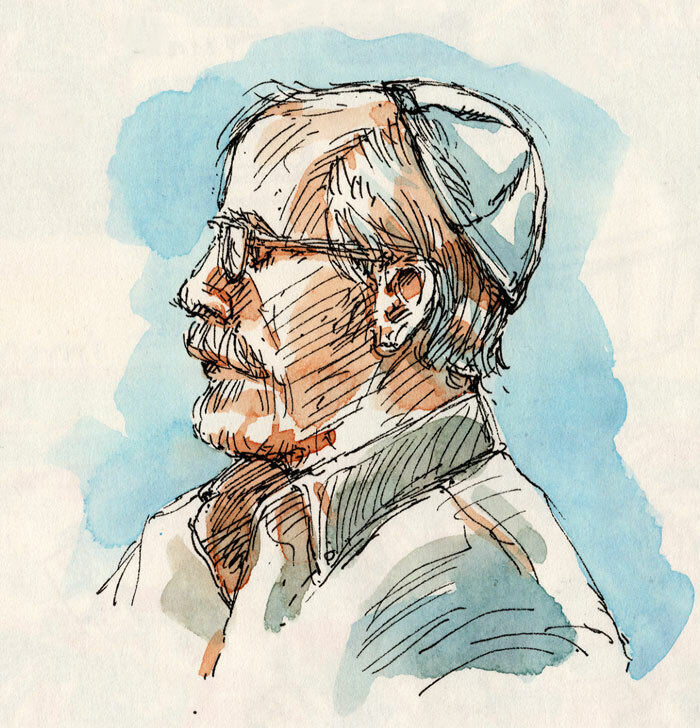 And after the sun goes down, in Jewish households all over the world a child will ask the first of the Four Questions: Why is this night different from all other nights? 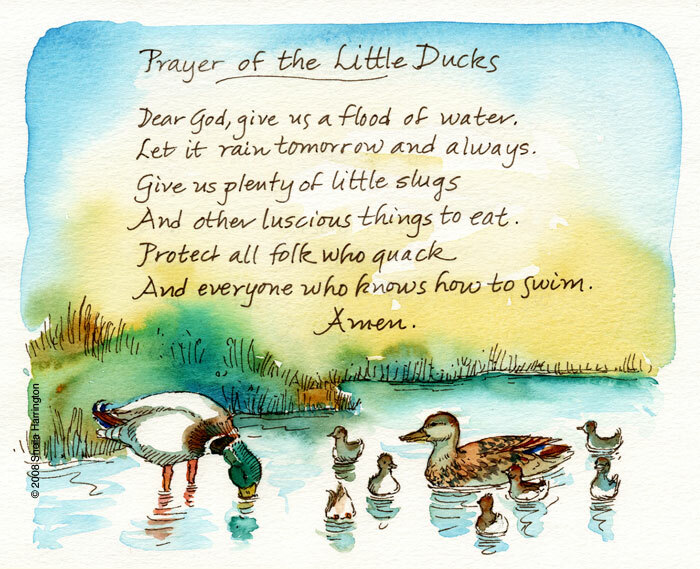 Perhaps because he’s such a water-lover himself, this is my husband’s favorite of the illustrated poems in our family dinner-table verse book. From Prayers from the Ark, by Carmen Bernos de Gasztold. My dear husband, celebrating Passover a couple of years ago with friends. I chose this picture from my sketchbook because we are once again entering the season. And also because I think he looks really good in a yarmulke. (I hope that’s not sacrilegious.) He was diagnosed with a heart condition since then and yesterday suffered an episode that sent us to the ER for most of the day. He’s in the hospital now, under observation on a new medication. Please send your kind healing thoughts his way. Every year about now I start muttering this poem to myself. 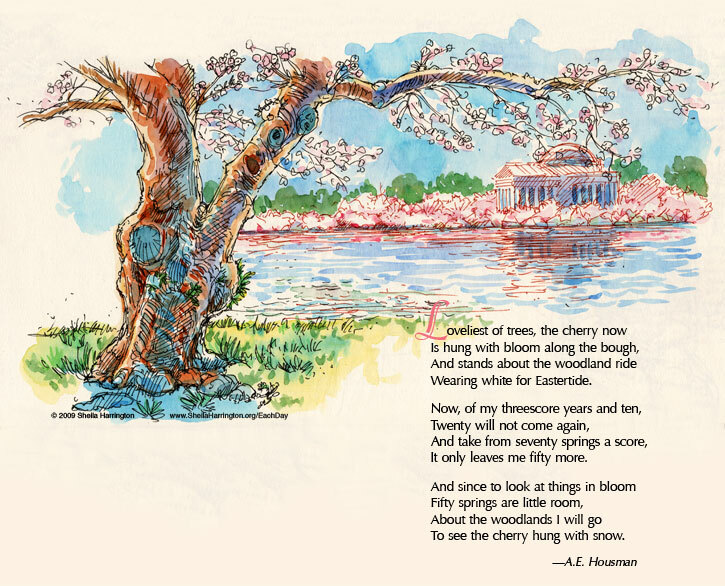 And I ponder how suitable it was that its author, Alfred Edward Housman (1859-1936), was born on this day, in the season of the lovely, evanescent, and melancholy cherry blossom. Housman was one of seven children of a rather depressed solicitor in Fockburg, England who had a tendency to invest heavily in failed inventions. No wonder he was depressed. Housman’s health was frail, and in school he was subject to bullying. As many were, in pretty much any fine olde boys’ public school. His beloved mother’s death when he was twelve was a severe blow. However, as a student he showed great promise, and he won a scholarship to Oxford, where he took up classics. Although he was brilliant, Housman was unwilling to expend much energy on what didn’t interest him, and he much preferred his studies of the Latin poets to philosophy and ancient history. He failed to pass his final exams, and there is speculation that the cause was not only neglect of his studies but also the disappointing (and lifelong) attachment he had developed to his school roommate, Moses Jackson, which never went beyond friendship (Jackson being heterosexual). Housman’s failure to pass his studies made it impossible to enter a position in academia, but Jackson, who couldn’t give him True Love, obtained for Housman through his connections the next best thing—a Steady Government Job. (And that sounds really attractive in the current economy.) So for the next ten years Housman was a London Patent Office Clerk by day and classical scholar by night, studying Greek and Roman classics independently and writing articles for learned journals, gradually gaining an impressive reputation that led to a professorship in Latin, first at University College, London, and then Cambridge University, where he eventually published several volumes of his meticulous textual analysis and translation. But do we remember Housman for his brilliant Latin scholarship? No, we do not. Unless we are brilliant Latin scholars ourselves. No, this clerk by day and scholar by night was somehow finding the time to write evocative lyrical poetry. In 1896 he assembled a collection of 63 of his poems and went looking for a publisher. 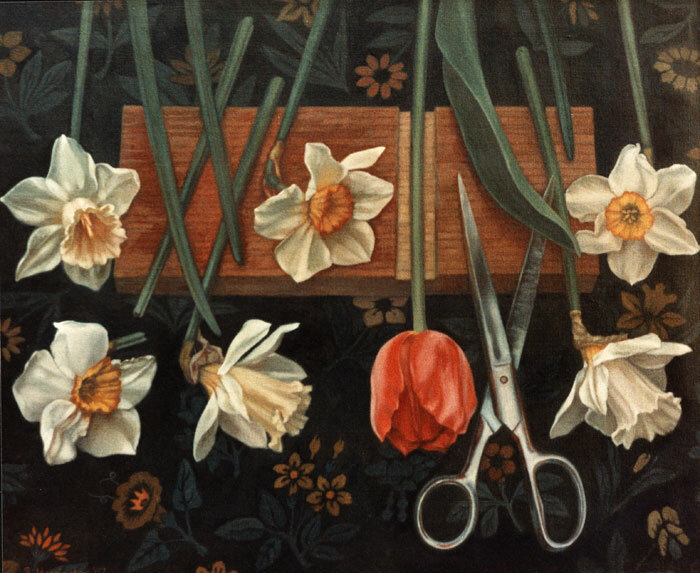 After being rejected by several, he decided to publish the collection, titled A Shropshire Lad, at his own expense, surprising his colleagues, who evidently had had no idea of Housman’s other interest. The book sold slowly at first, but as musicians set some of his ballad-like poems to music, its reputation grew, and with the advent of the First World War, his themes of death and loss struck a chord in the public. It became one of the most popular volumes of serious poetry ever published. Apparently an aloof, intimidating professor with a sarcastic wit, Housman was not an easy companion, and when Jackson married, he did not even send Housman word. Housman gradually became increasingly reclusive. But when Jackson was gravely ill in Canada, Housman decided to assemble his unpublished poems so that his old friend could read them before he died. These were published as Last Poems in 1922, 36 years after A Shropshire Lad. One more collection was published posthumously. And that’s it. What Housman created as a sideline (“I am not a poet by trade; I am a professor of Latin”) has become an inextricable and unforgettable component of the body of English poetry. Housman said once, “The emotional part of my life was over when I was thirty-five years old.” Yet his poetry, at once spare and vivid, is imbued with feeling, without being sentimental. What he did not permit himself in life he has given us on the page. So go for a walk under the pink and drifting petals, and wish Alfred Housman a Happy Birthday. I know, I know, this is cheating because I haven’t drawn or painted it, but I had to put up the results of the Quilt Raffle for Haiti project. Today some of the members of our little homeschooling community gathered for a celebration and official ticket-drawing. It was fun to read them as we tossed them into the basket—there were lots of Mid-Atlantic and New England tickets, but also some from as far away as Montana, Oregon, California, and (Olde) England. The winning ticket belonged to: a kindergarten teacher in Baltimore, Maryland. Congratulations! 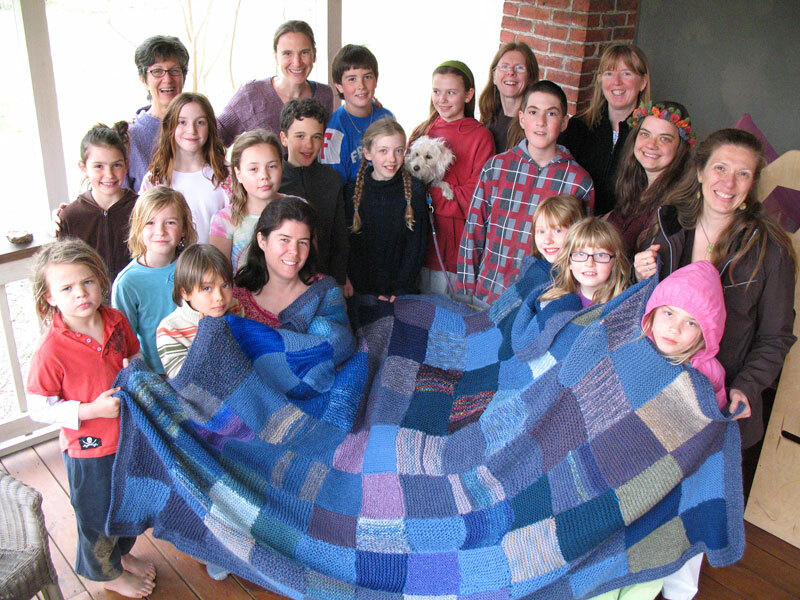 Let’s hope this beautiful quilt helps keep her warm and well for her little pupils during the last few weeks of chilly weather. And in 10 days we sold 143 tickets, raising $1,430 for Haiti Projects! Thank you, thank you, everyone who purchased tickets for this worthy cause! We are hanging on to them for a second drawing, later, because there were some extra unused squares that will be transformed into…we know not what. You may be hearing from us. 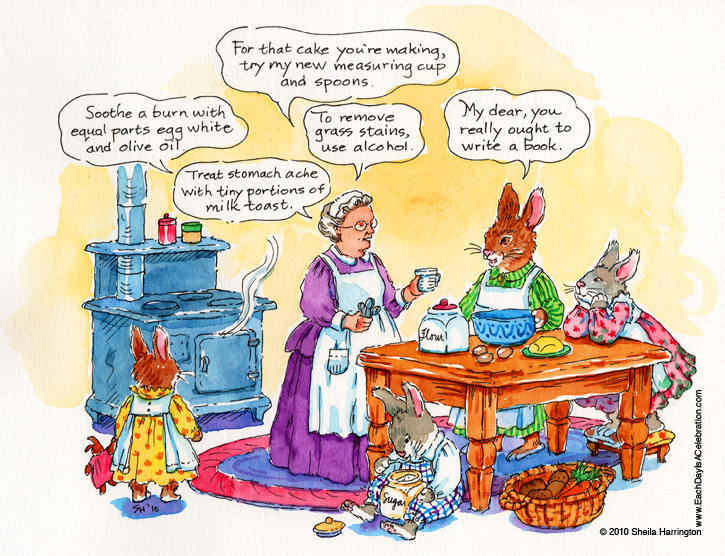 If you were an American housewife setting out to bake a cake or a loaf of bread in the 19th century—or the 18th—or the 17th—you generally relied upon what you had learned at your mother’s side. You assembled flour and milk and sugar and milk and shortening and eggs, estimating amounts as best you could and combining them from memory in the proper order. In 1303 Edward I of England had standardized the pound, and the American colonists brought with them, and still use today, the old English standards of measurement (the British have revised their system several times since then, so we no longer match), and most farm wives could measure in pounds, pecks, and bushels. But as for smaller units you were on your own with vague descriptions (“a dab of cream” “a piece of butter as large as an egg”) or whatever teacups you were fortunate enough to possess. That is, until Fannie Farmer (1857-1915), who was born on this day in Medford, Massachusetts. Her father was an editor and printer, and her parents believed in higher education for girls, but Fannie suffered a stroke at age 16 (! ), which prevented her attending college. What she could do, however, was take up responsibility for the household’s cooking. Evidently she had a natural talent. When the family home became a boarding house, it gained a reputation for its fine meals. So Farmer was encouraged by a friend to obtain teacher training at the Boston Cooking School, which took a scientific approach to food preparation, and she did so well that she stayed on to become Assistant Principal and then Principal in 1891. And in 1896, Farmer published The Boston Cooking-School Cookbook. Now, cookbooks were not unknown to American housewives. Amelia Simmons’ American Cookery had been self-published in 1796, with colonial favorites like pumpkin pudding, watermelon pickles, and spruce beer (Mmmm! ), and by the late 19th century there was an explosion of cookbooks by women, offering medical mixtures (“A wash to prevent the hair from falling off”) and household advice (“Words of Comfort for a Discouraged Housekeeper”—now there’s one we could use) as well as recipes. Farmer’s cookbook was even more comprehensive, including sections on the chemistry of cooking and cooking techniques, the specific components of food and why each was necessary for health, how a stove works, how flour is milled, what happens during fermentation, and extensive detailed advice on caring for the sick. In addition to these she offered recipes with straightforward, precise directions and—Ta-Daaa!—Actual Measurements, the tools for which (the standard measuring cup, divided into ounces, and graduated measuring spoons) she had created earlier. The publisher, Little, Brown, had “little” faith in the book’s success, and insisted Farmer foot the printing bill herself. When the book became hugely popular (it has sold millions of copies and has never been out of print), this turned out very well for her because she had retained copyright. Ha! Unlike poor Irma Rombauer who unfortunately sold her rights for $3,000 to Joy of Cooking’s publisher. Farmer’s success enabled her to open her own cooking school. She wrote other books, one of them focusing on cooking for the invalid; was invited to lecture at Harvard Medical School (which lectures were widely printed and read); wrote a regular cooking column in the Woman’s Home Companion; and continued to test and invent recipes and to lecture until the last few days of her life. 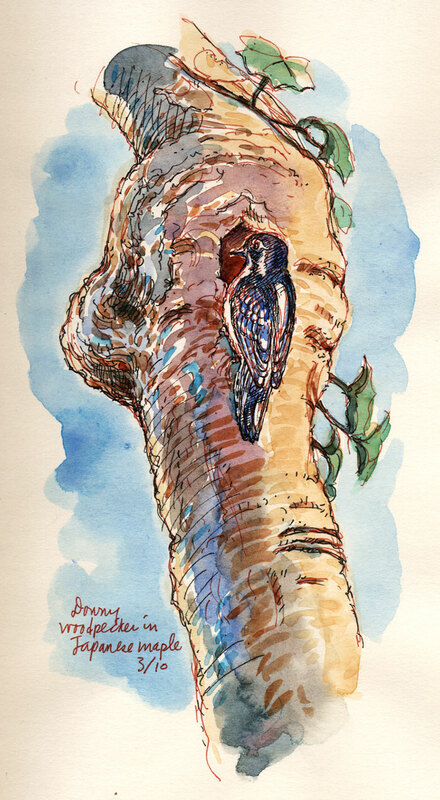 I was sitting in the garden sketching plants when I became aware of a persistent rat-tat…rat-tat-tat…rat-tat… I finally looked up, and there on the tree trunk a few feet away was a female (no red patch on the head) downy woodpecker pecking for her breakfast. I had been sitting so still that she hadn’t paid attention to me. So I ve-e-e-ry slowly turned the page in my sketchbook and drew her instead. You are currently browsing the Each Day Is A Celebration blog archives for March, 2010.